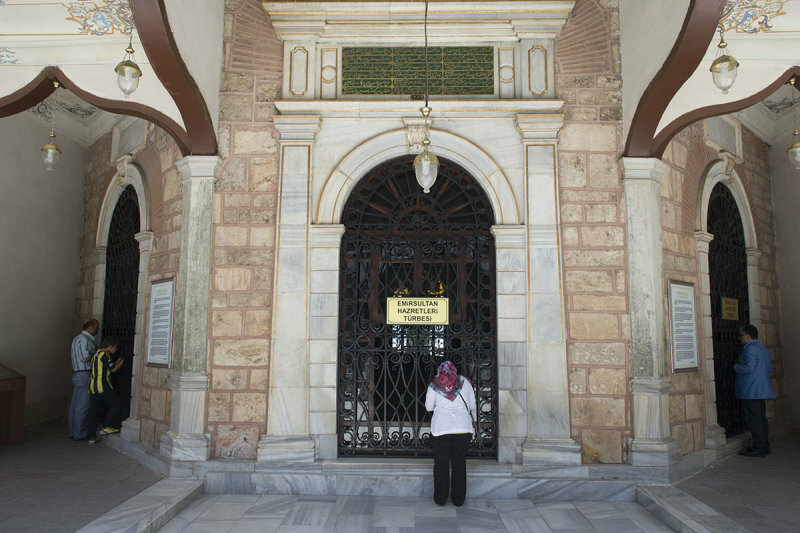 On the picture: The ‘honorary window’ of the Türbe (mausoleum) of Emir Sultan and his wife Hundi Fatma Hatun, which is situated at the south side of the courtyard (and opposite to the mosque). Rebuilt in 1868, this mausoleum’s exterior ornaments display a pure late-Ottoman ‘Ampir’ style (= influenced by the ‘Nouvel Empire’, the French Neo-Classical style under Napoleon III). The ‘kitabe’ (building inscription) above the window is 50 x 150 cm large and bears a long text honoring both Emir Sultan and Sultan Abdülaziz, who rebuilt the funeral monument.